A new retailer has joined the cross-platform digital locker system. Movies Anywhere has announced the addition of Microsoft Movies & TV to its lineup of supported digital retailers. The service now joins previously compatible stores like VUDU, iTunes, Google Play, Amazon Prime Video, and FandangoNOW. "This launch has been highly anticipated by our most passionate movie fans, and we are very excited to bring Microsoft into the Movies Anywhere family," said Karin Gilford, General Manager, Movies Anywhere. "Movies Anywhere brings your movie collection together quickly and easily, and we're thrilled to share this benefit with Microsoft customers. Since our launch just nine months ago, consumers have stored more than 135 million movies on our app, and both content and quality continue to grow with the onboarding of new retailers like Microsoft." 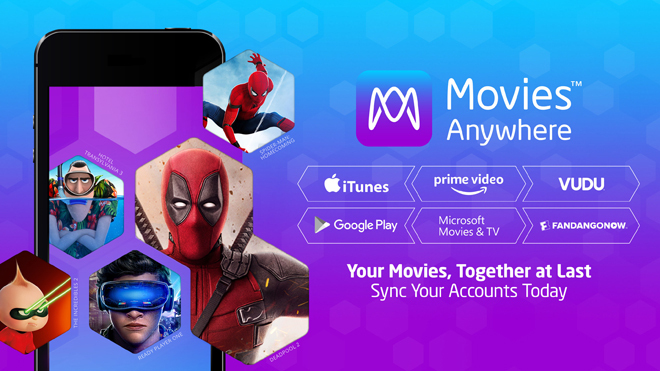 Movies Anywhere allows users to buy, redeem, and store digital films from five major studios and then sync those titles across multiple retailer apps and playback devices. The platform supports a growing collection of over 7,500 digital titles from Disney, 20th Century Fox, Warner Bros., Universal, and Sony. And beyond the new addition of Microsoft Movies & TV, customers can also link to their VUDU, Amazon Video, iTunes, Google Play, FandangoNOW accounts -- letting users access all their supported content on the service and device of their choosing. "We are thrilled that Microsoft now supports Movies Anywhere," said Pedro Gutierrez, Director, Movies & TV, Microsoft. "With Movies Anywhere, all of your eligible movies from Microsoft can be enjoyed across your favorite screens at no extra cost. Microsoft Movies & TV allows you to watch the newest movies across your favorite devices — like Xbox — before streaming services or disc, and without subscription or membership fees." To help mark the occasion, Movies Anywhere and Microsoft are also offering two limited-time promotions. First, Movies Anywhere users will get an exclusive sneak peek at a bonus feature from Deadpool 2. In addition, through August 28, customers who sync their Movies Anywhere account with Microsoft or another supported digital retailer for the first time will receive a free digital copy of X-Men: Days of Future Past.